By mritch8, September 5, 2017 in What motorcycle should I buy? Just sold my 125 for a 250f. Found two with less than 60 hours which was my limit. 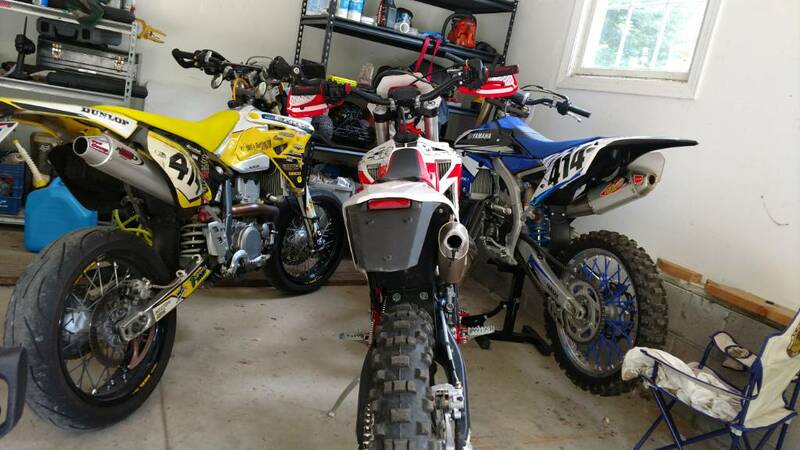 I want to know what to expect for running cost for each bike and how often is need to do motor work. And lastly thoughts on which bike to get for long term reliability up to over 100 hours without spending a bunch of money on them. Hmm , the Yamaha guy can't figure out the year and the Honda just got the new plastic treatment. Either is potentially a bad choice. what do you mean cant figure out the year? and what makes you think its a bad choice? The title of the ad is 2015 YZ250F. The ad itself says it's a 2014. That's suspicious. As for the Honda, it's an age old trick to put new plastic on a clapped out roach. In either case, you can't evaluate a dirt bike from pictures, you need to examine them 1st hand. Just don't get too disappointed when your 2am beauty queen turns out to be a 7am bush pig. My thoughts are it's a great bike . I have one too. If it checks out and the price is right then buy it. The 15 has a quick access to the air filter, check it to make sure it's clean. There is an oil window down by the shifter, take a peek to see the condition. These are indicators of the owners maintenance practices. Also, the bike only holds around 25 ozs of oil, it needs to be changed relatively often. The bike should start 1st or 2nd kick. If not, that's a warning sign. It's normal for that motor to put out a light, small puff of whitish to grey smoke the 1st time it's revved if starting a cold engine. Once warm it should stop. If it continues to smoke that indicates a problem such as worn rings(blue smoke) or leaking head gasket (white smoke). Ride it to make sure everything works and feel correct. The response should be perfect at every RPM and throttle position. If there is any bogging or sputtering then something is wrong. Other than that, look the chassis over for the usual, play in bearings, leaking suspension, ect. Ok thanks for all the help. What would be an indicator of if he's not lying about the bike having 50 hours and how do I know if Valves and bottom end are good? The bottom end by sound and vibration. Valves are always the thousand dollar question with used 4 strokes. Ask if and how many times they have been shimmed. Ideally they shouldn't have needed shimmed since it's low hours. If you know anyone with the tuner it can read engine hours. Yea I know an engine guy. Can I buy those readers online? And yea that's what I'm afraid of haha but he says it's low hours and it looks low hours. He only used it a little for trails and so did the first owner. Sadly he doesn't know if they have been done. So I'm assuming that means they haven't been shimmed. Excessive wear on the cases (boot rub) could be a sign it's a higher hours than stated. For fear of overheating, I'd be a bit doubtful in a 'woods' or trail 4T motocross race bike often ridden at a slow pace. remove the radiator cap and observe if any there are any excessive bubbles making their way to the top (blown head gasket). Ok I'm new to the 4t game so now do you know if it's overheating? excessive bubbles in the coolant while idling is a sign of head gasket problems that may have been caused by overheating. 4-strokes get hot in a hurry when idling at a standstill or moving too slow. Valves out of clearance will make the bike extremely difficult to start when its cold. Having said that, checking and sorting valve clearance isn't rocket science. Its a couple hours at most for a hobby mechanic. Learn to do it yourself. When I bought my 250F, the guy had clearly warmed up the motor because it started up right away when I bought it. Yet within a few rides it was increasingly difficult to start cold. We did the valves and the problem went away. Its just a 4-stroke thing.